Thanks to ex-President John Dean we have a large collection of race photographs. They are organised by years and for some years we have a lot (1978 – 400+), others very few (2004 – four). The photographs have no descriptions, the quality varies, and there are some duplicates. If you can identify Spartans before they achieved their numbers, please let us know. 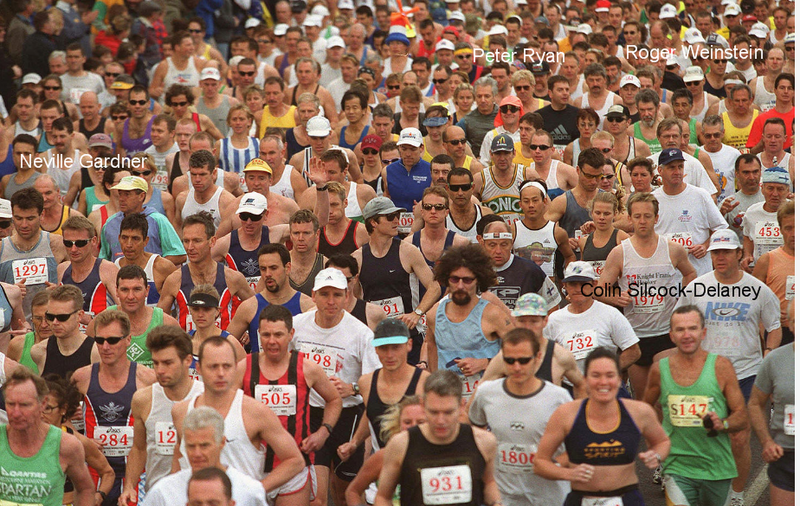 If you have some Melbourne Marathon photographs that we could use, we would be delighted to upload them. John Dean has identified four runners in this photo. Anyone else with some more names? Jim Yatomi-Clarke (S0530) is in the top right hand corner to the right of Roger Weinstein. Greg Wishart (S0162) is to the right of Jim. Clarke Whitehand (S0160) has identified Kevin Chandley (S0311) in the bottom left hand corner. Peter Smith (S0717) has identified himself as being diagonally behind Kevin, in the third row. He has confirmed that this was the 2001 event.